What would you do in a wood of your own? What Do Owners Do With Their Woods? 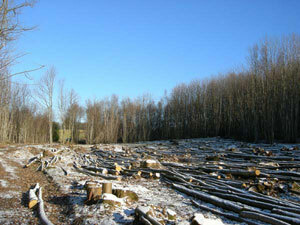 Coppicing of sweet chestnut in Kent and Sussex is a traditional activity which goes back hundreds of years. This involves not only the regular cutting of chestnut poles but the processing of these into useable materials. Such processing will usually include debarking and splitting - all of which is done in the woods where the chestnut is cut. Chestnut coppice products are mainly used for fencing and are still very much in demand and because chestnut coppice is a hardwood they tend to last for a several decades. Chestnut paling and post and rail fencing is in high demand and is even exported to mainland Europe. Many woodland owners in the south east will have areas of chestnut coppice and some will take on the coppicing work themselves but others will want to contract out the work. Finding coppice workers nearby is usually done by word of mouth and they are usually remarkably skilled and often they have a long tradition of coppicing within their families. 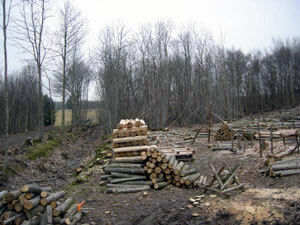 For example at Woodlands.co.uk, we work with a coppice worker whose father was a coppicer and his grandfather before him and probably several generations before that. There are lots of advantages to such traditions - fathers can teach the skills to sons, equipment can be easily shared and knowledge of particular woodlands can be passed on very directly. Because the same areas are coppiced every 15-25 years a coppice worker will often remember the last time an area was cut and if he doesn't his father will! 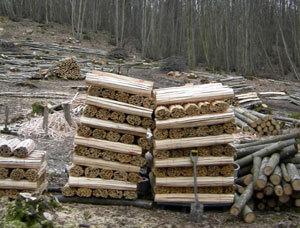 Roughly 60% of the UK's chestnut coppice is in Kent and East Sussex. The area covered by chestnut coppice in Kent alone is over 10,000 hectares and about 15% is in active management. Various studies have looked at why more of our chestnut coppice is not managed and come up with various concerns but one of the most interesting is the pressure on he woodland workforce. Debbie Bartlett, an expert on the subject, with both practical and academic interest in it, has studied the dynamics of coppice workers. She observes that "in a developing country these would be considered as forest dependent people, their livelihood issues would be a material consideration in any plan relating to the woodland and we would be referring (reverently) to their Traditional Ecological Knowledge." In her recent paper, "In pursuit of the truth about coppice woodland management in the South East", Debbie Bartlett points out how important coppicing is for wildlife and for providing mixed-age structures and edge habitat. She questions the wisdom of the recent drive to increase woodfuel production rather than higher value coppice products and she is concerned that coppice workers are usually a forgotten by funding initiatives. Coppice workers are often fairly intimate with the woodlands they work in. They may well know the woods from previous coppicing cycles but they have also spent a lot of time in situ processing the chestnut. Their knowledge is mostly conveyed by word of mouth - so our advice to owners, based on almost 25 years of working with coppicers, is that you should try to employ these traditional coppicers but also spend time with them - and you will learn a lot more about your woodland. At Coppicewood College we train young people on how to manage a coppice woodland and the associated crafts. This is an important resource for the future of coppicing and we attract students from all over the UK. As a charitable organisation, we depend on grants and donations as well as collecting fees for our short courses. Right now we have a selection of interesting courses such as spoon carving, charcoal making,pole lathing,green woodworking and coppicing. Also we are looking for woodland owners who are interested in taking on our graduates to manage or restore and thenmanage their wooodlands. It’s true that vocations being a family rite in our industrious country are becoming scarce and knowing that coppicing families are still very much an active part of the woodland’s management is of a great comfort. You’re absolutely right with the passing down of knowledge from father to son/others. valuable information is often lost when written in the side lines of a book: nothing beats the knowledge gained from hard work and true experience.